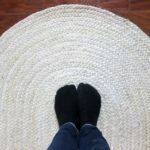 We are officially on week five of the One Room Challenge, hosted by Linda atCalling It Home. Usually, I’d be panicking at this point, like staying up every night until midnight so that I can get the whole room done in time to photograph it for next week’s deadline, but I have big news! 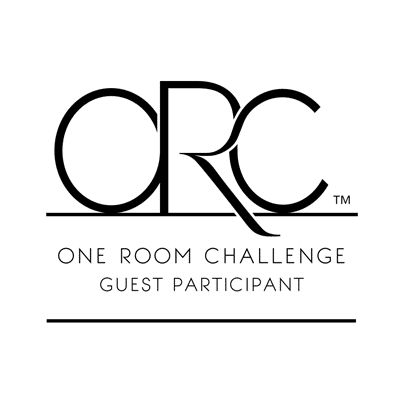 The One Room Challenge was extended to a 7th week! This was done to help some of the US participants who have been experiencing some not so great natural disasters, and need a bit more time to work on their spaces. 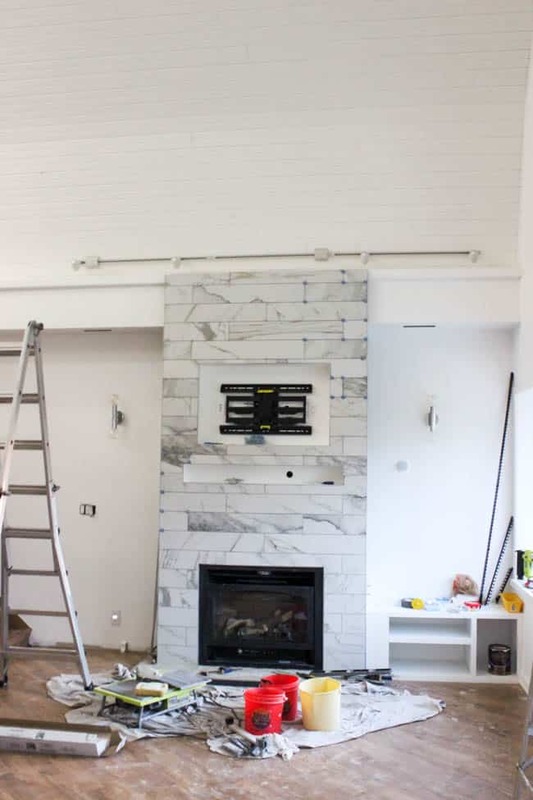 But I’m not complaining – you’ll see how much more work we have to do, including finishing our fireplace tiling job! 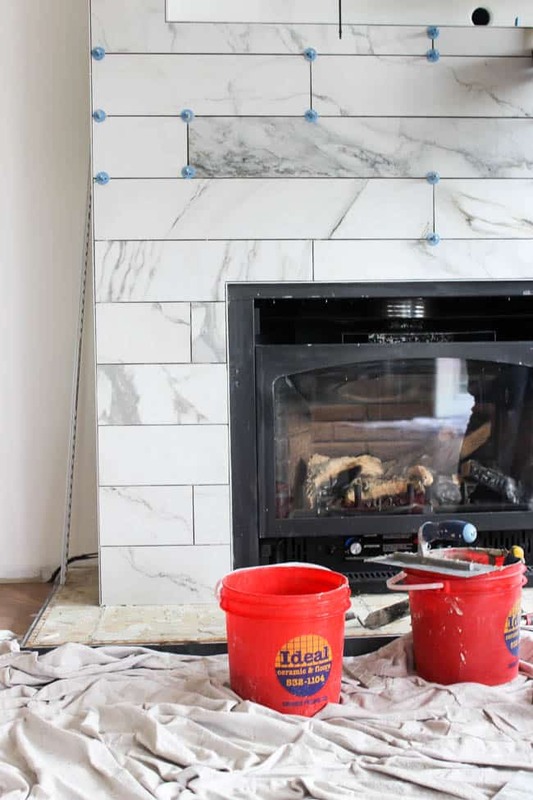 We finally started tiling our fireplace this week.. and that’s basically all we got done! lol. Our best chance to work is in the evenings, and we didn’t have every evening free this week, so we sort of failed on the progress front. 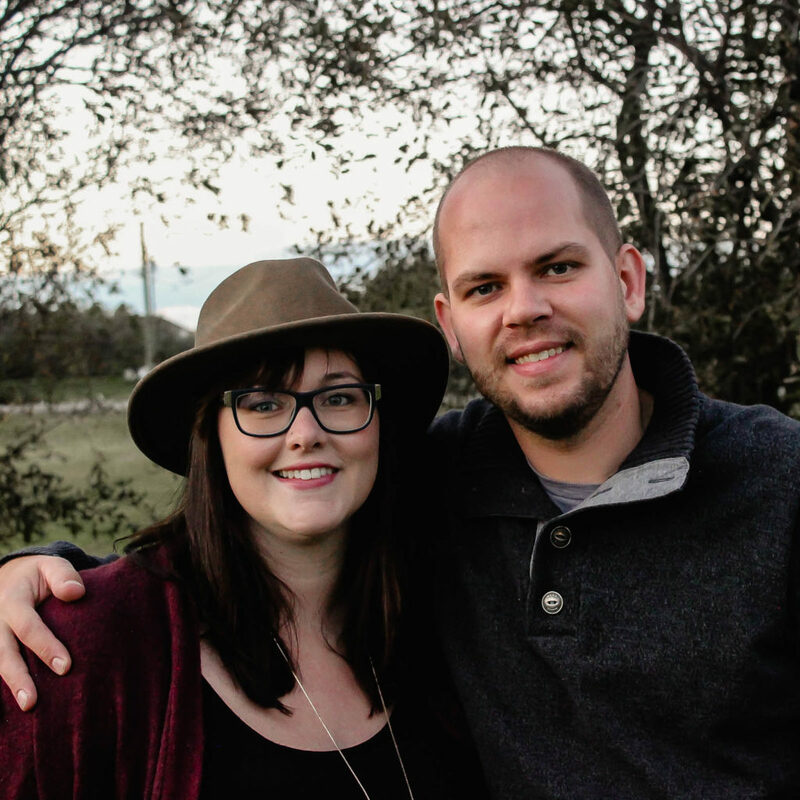 But good news… we tried a new tiling system that made our lives a HECK of a lot easier! 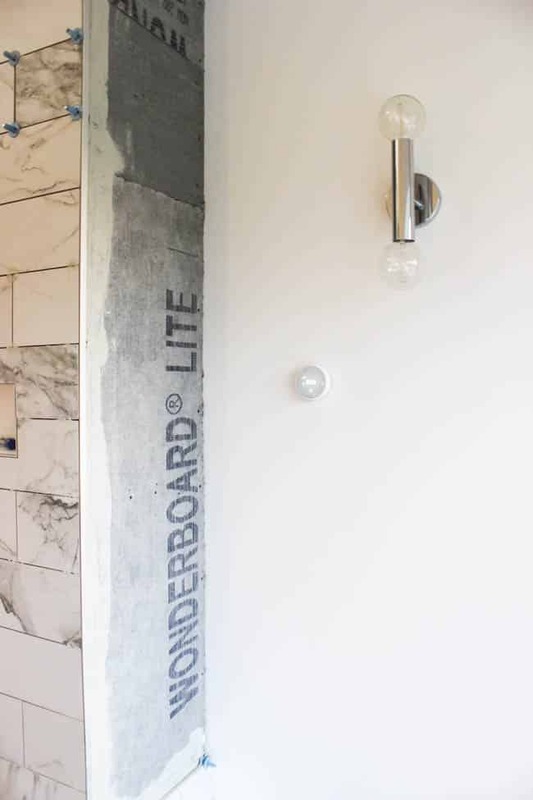 When we tackled our Modern Bathroom Renovation, we did a LOT of tiling. When it came to leveling our vertical tiles, we mostly used a small hand level, our eyes, and our fingers to feel whether it was level or not. This time our fireplace is the main focal point of our new living room and we were looking for something a bit more accurate. Enter the ATR Tile Leveling System. 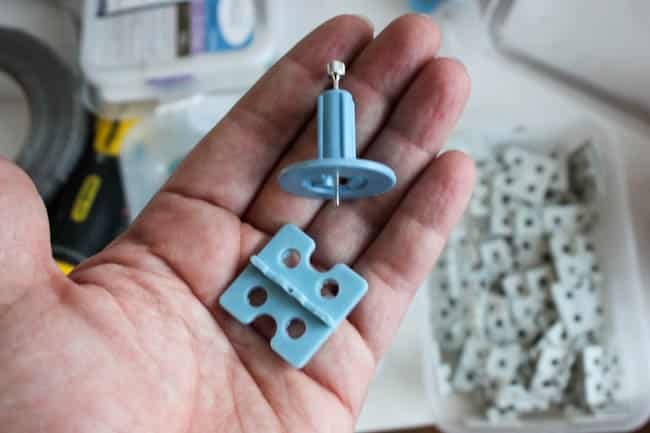 The way these guys work is that you attach the screw (with the spindle on it) into the flat base, then you put the flat piece down under the tile. You just start setting your tiles, then place one of these bases at each tile intersection. There are bases for two tile, three tile, and four tile intersections. Once you have the tiles layed, you tighten up the spindles. 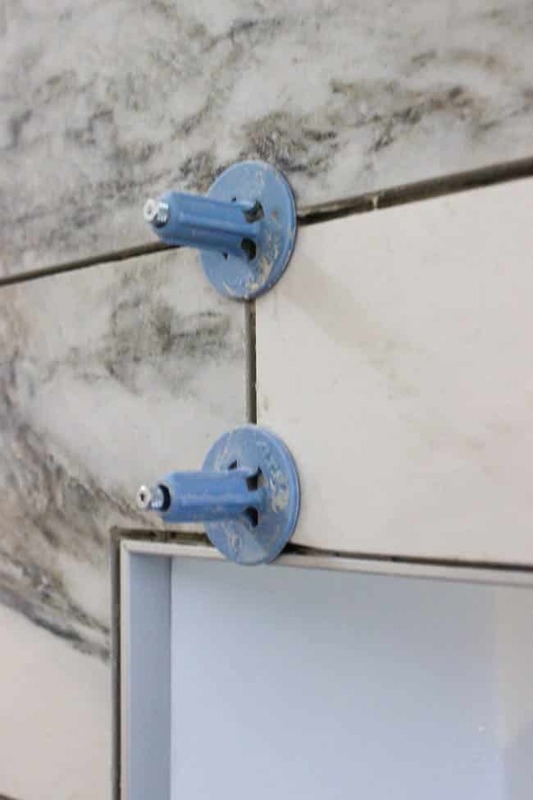 This tightening keeps the tiles perfectly level. It works kind of like a clamp and pulls the adjoining tiles into the same plane. 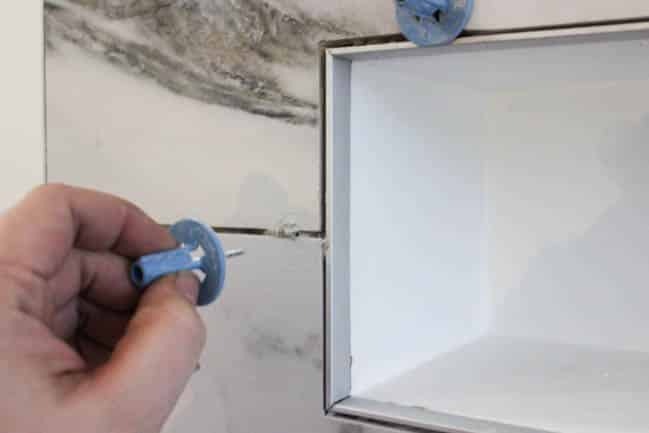 When the tiles are set and the thin set is dry, you can unscrew the screw/spindle and easily pull it off before you grout the tiles. Honestly we were VERY impressed with this system! 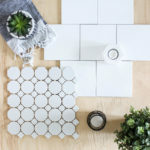 I couldn’t believe how easy it was to use them, and our tiles are set perfectly. They were easy to use and definitely worth the money. I would definitely recommend the ATR System. So we got the entire front of the fireplace tiled. 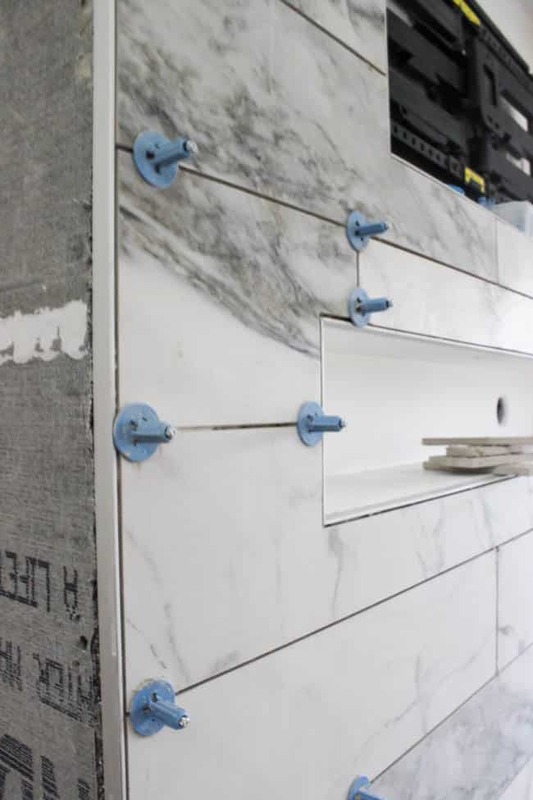 Just have to do both sides, and grout it all…. shouldn’t be too hard, right?! lol. Aside from the fireplace, we got a couple of installs done too. 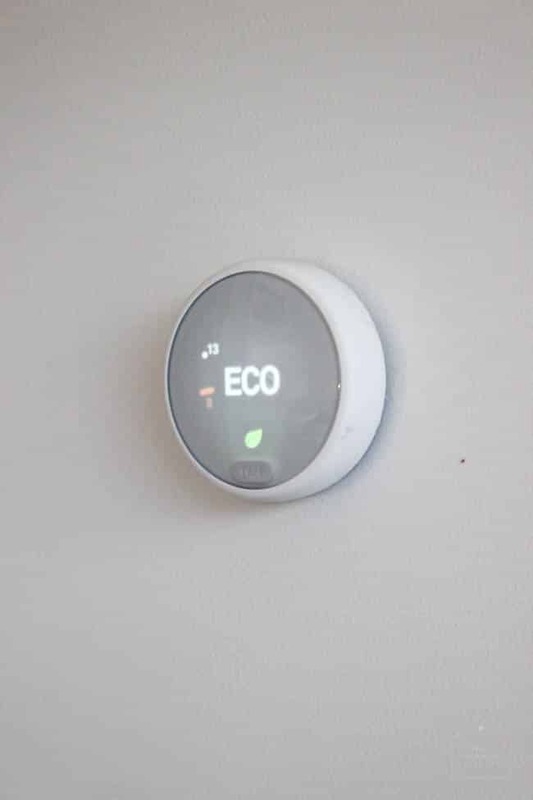 Like our new Nest thermostat to control the fireplace temp! Or our beautiful new sconces beside the fireplace. 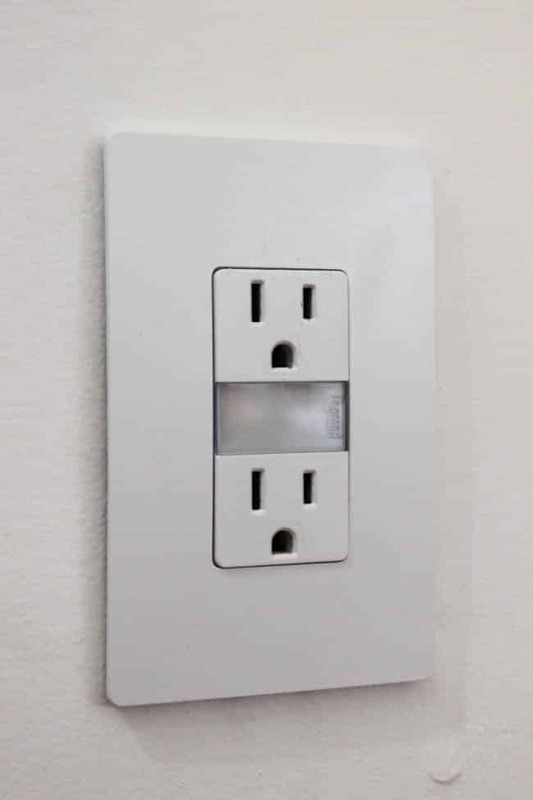 Or our new modern outlets from radiant by Legrand! 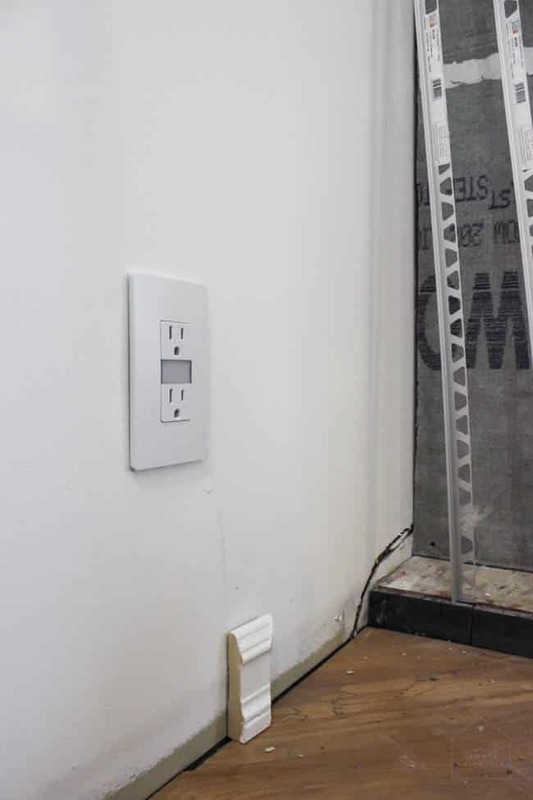 How beautiful are these screwless wall plates? Have you seen anything like this before? I hadn’t! And I’m in love with how sleek they look! Not to mention the beautiful outlets themselves! Like the one above with a nightlight, or the one below with usb hubs. So perfect for our modern space! Please share your thoughts! I’d love to hear what you think of our progress! 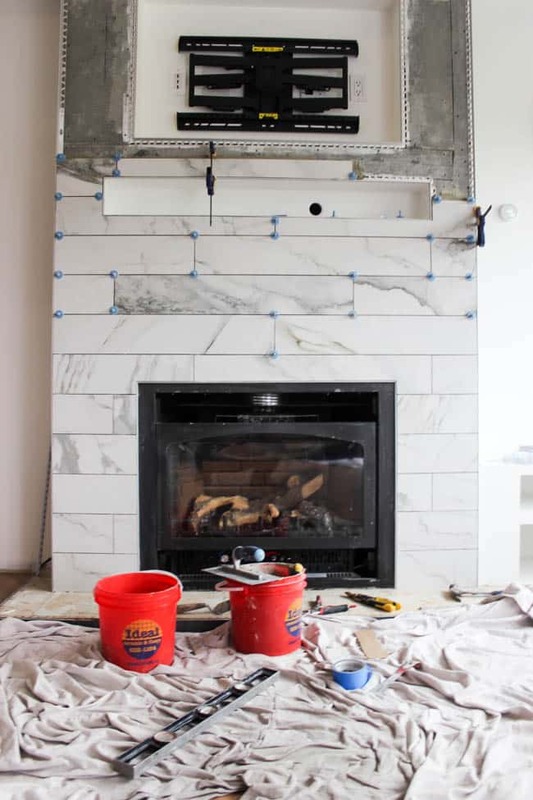 I love the tile on the fireplace and the leveling system is brilliant! Can’t wait to see the whole space during reveal week! OMG, the tile you chose is stunning! I haven’t seen anything else like it and I am in major love! It is going to look so awesome, what a huge focal pint to your room! Wow! That fireplace is amazing! Good luck finishing up, it looks beautiful. Love the tile! It’s looking SO amazing. Great job! Yeeeeesssssss!! That tile is stunning!! Can’t wait to see this space all completed & styled. It’s going to be so so SO good!! 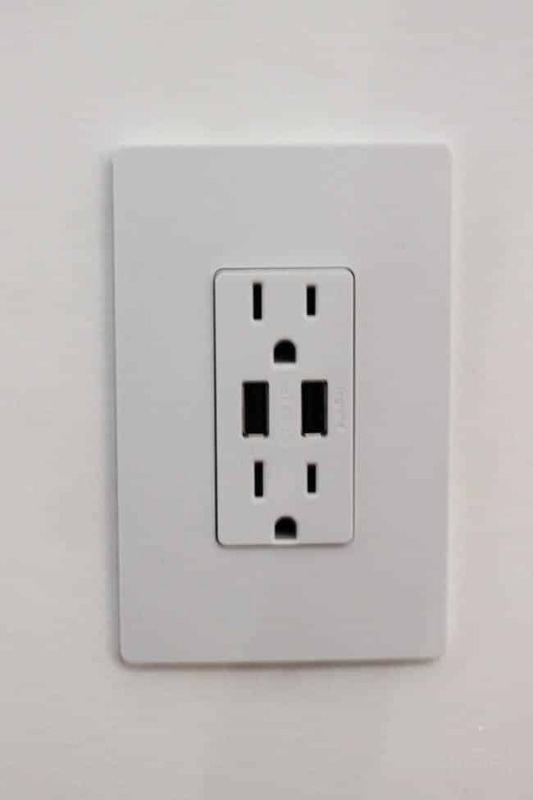 great choice on the plug (I recently opted for the ones with the USB key slots as well) and that sconce is stunning. looking forward to seeing the fireplace in action! Oh my goodness, alllllll the heart eyes for that tile! 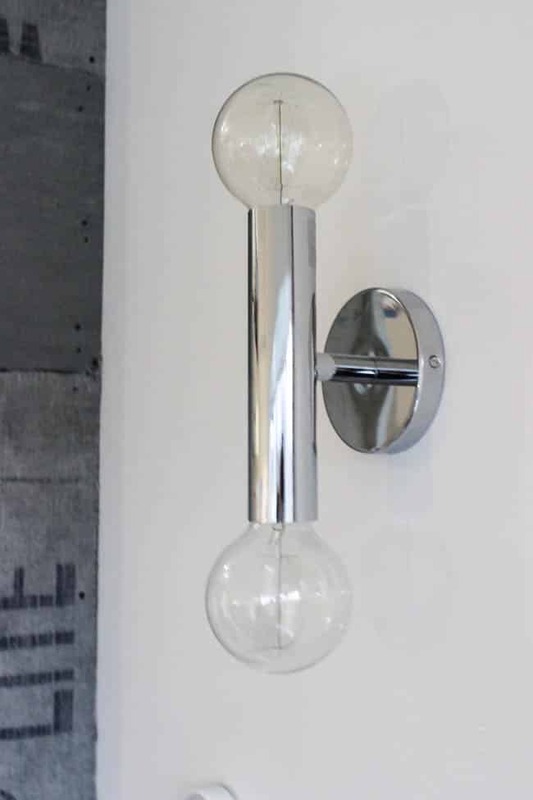 I love the sleek, modern design your choosing – the sconces tie in so well with the tile. I am so looking forward to seeing how this room looks when it’s finished! That tile is gorgeous! I have not tried tiling yet, but this system makes it look so much easier! 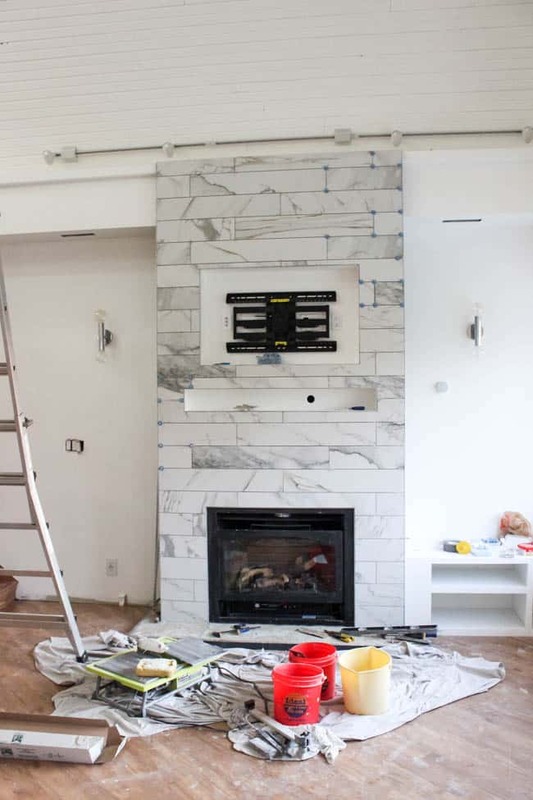 I love the tile you selected for your fireplace and can’t wait to see your final reveal! It looks so good so far!! that fireplace…WOW!!!! That is amazing and I love your sconces too. I can’t wait to see this reveal Lindi!! 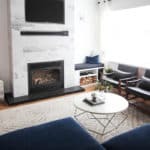 I love your fireplace and the system you used! Where’s the tile from? I can’t wait to see it all done! 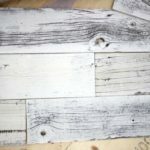 I Love the tile you chose! Wow! The tile work looks amazing – always looking for better ways to get straight lines! The fireplace will be a real showstopper. I too am thankful for the extra week – much less panic on this one for sure. Oh my gorgeous!!! That tile looks amazing! And such a huge impact floor to ceiling! wow, that looks amazing so far! 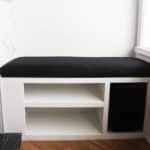 You have done a lots of work to make your house cozy. Thanks for recommend the ATR system. I checked it out. Its looks solid to me. You are right, when it’s about living room we need to double check all the set up. Your to do list is impressive, it’s look like you are just few step behind to perfectly end the project. Amazing! Good luck with your project!